WORCESTER, Mass.--Recent trials by medical device manufacturers have reportedly confirmed that using a cryogenic deburring process is "highly effective" in removing complex machine burrs from PEEK medical implants. The Cryogenic Institute of New England, Inc., provider of the Nitrofreeze® cryogenic deburring service, says that several major medical device manufacturers have also independently determined that cryogenic deburring is a safe technique for removing machine burrs from their PEEK implants and have approved its use for their parts. "These positive results continue to expand the adoption of our Nitrofreeze® cryogenic deburring service by medical device manufacturers as they shift away from less reliable and more expensive hand deburring," said Robin Rhodes, president of the Cryogenic Institute of New England, Inc., in a statement. "The Nitrofreeze cryogenic deburring service offers medical manufacturers a safe, clean, and reliable technology to remove machine burrs." Computer numerical control (CNC) machines that are used in the production of PEEK medical parts often leave residual burrs after the milling process is complete. Because many of these parts are implanted into humans, they must be completely burr-free while maintaining critical design features. The Nitrofreeze cryogenic deburring process freezes the part to maintain essential tolerances, including surface finish and critical dimensions. Once frozen, the parts are tumbled while cryogenic-grade polycarbonate media are blasted at them to remove the machine burrs. Ryan Taylor, product marketing specialist at the Cryogenic Institute of New England, says that the Nitrofreeze cryogenic deburring service continues to be adopted in the medical device industry, especially for the rapidly expanding segment of in-vitro (implantable) devices. "Medical device manufacturers of PEEK parts are quickly realizing the advantages of Nitrofreeze® cryogenic deburring, including fast turnaround, lower costs, and higher quality." 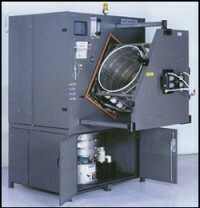 The Cryogenic Institute of New England (www.nitrofreeze.com) offers deburring for medical devices on a contract service basis. The company's service can accommodate small orders or high-volume production lots of hundreds of thousands of parts per week. Most orders are processed within two days of receipt at the company's main facility in Worcester, Massachusetts. PEEK is a trademark of Victrex plc.